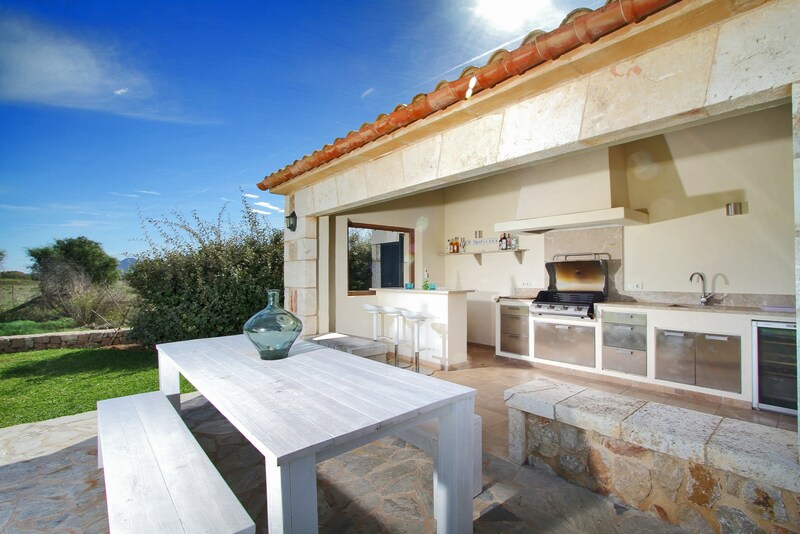 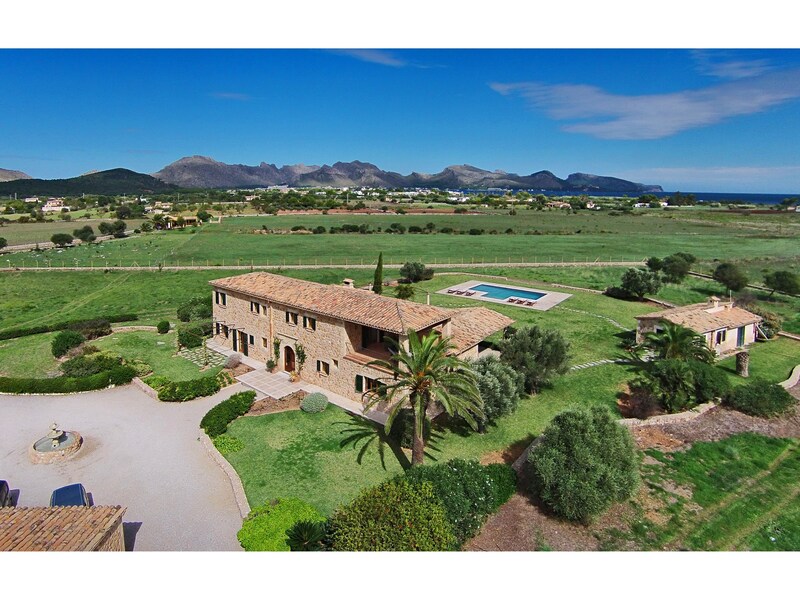 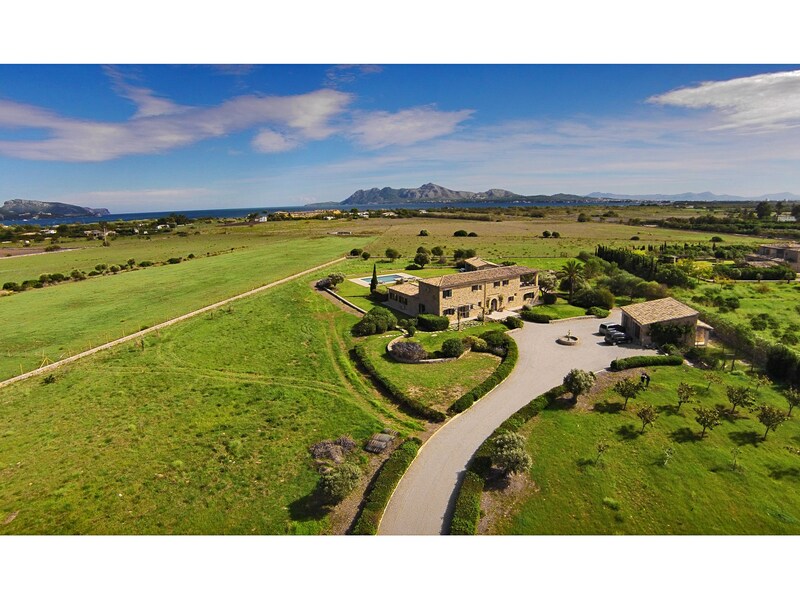 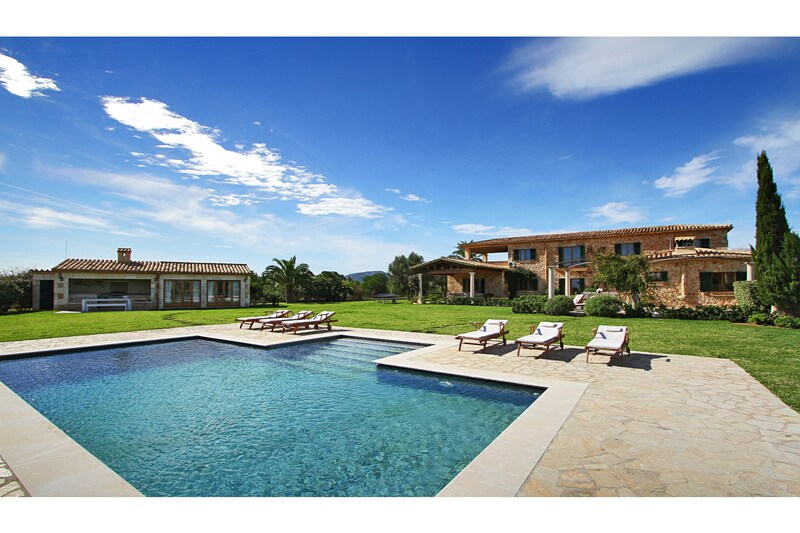 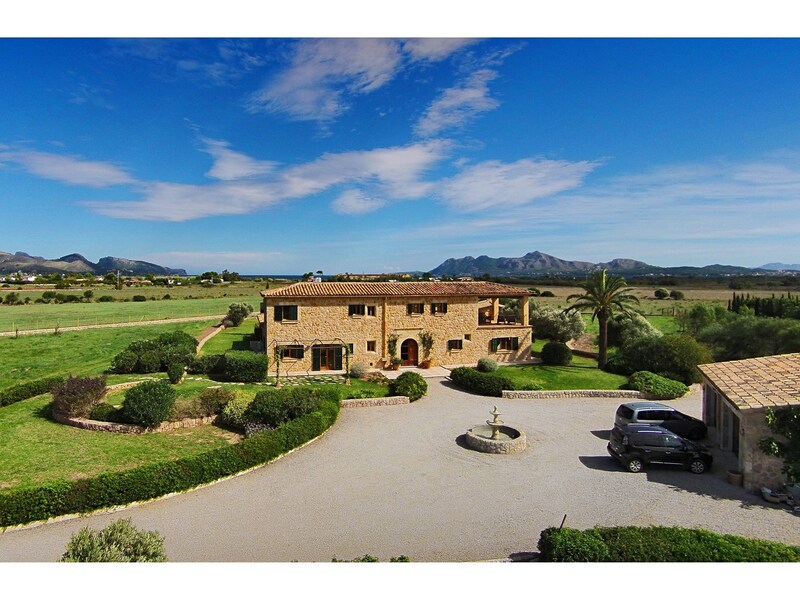 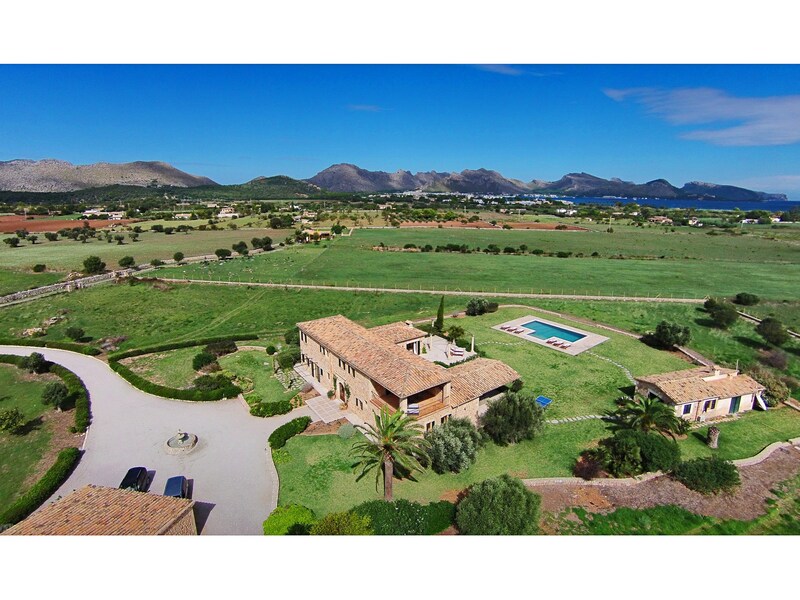 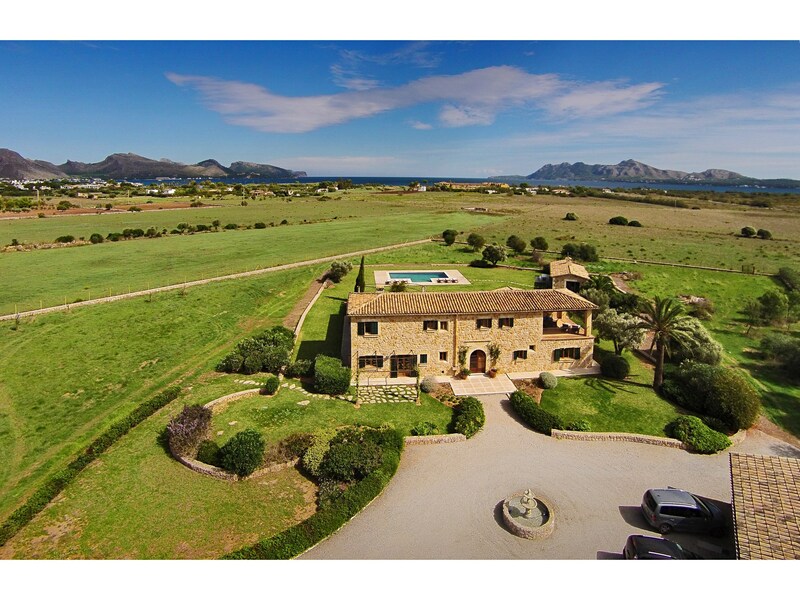 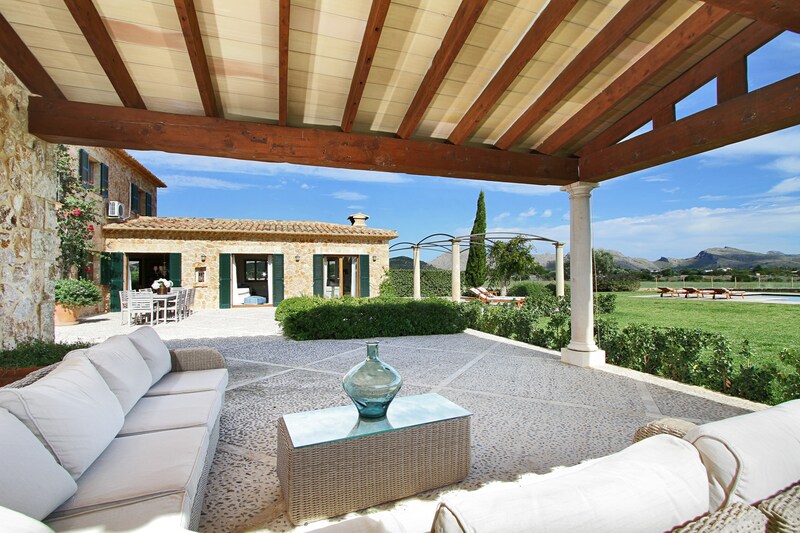 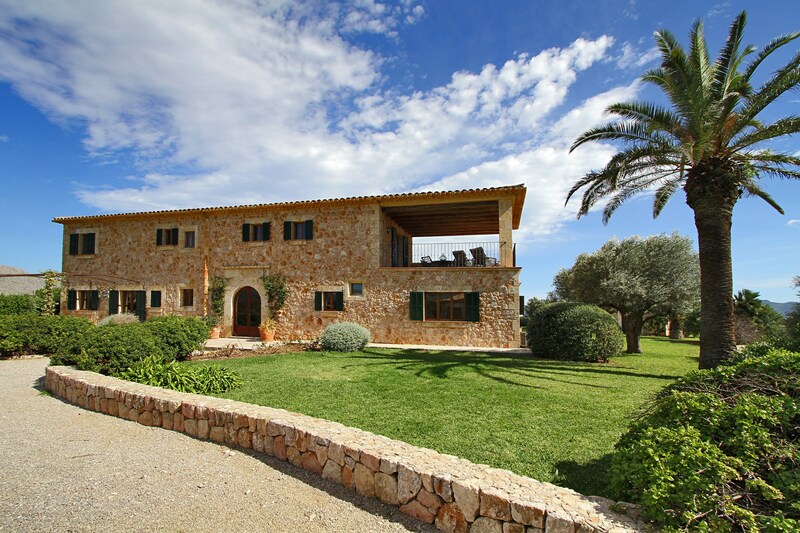 Finca Can Cuarassa offers everything you need for a fabulous holiday in luxurious surroundings in the upmarket area of Pollensa in northern Mallorca. 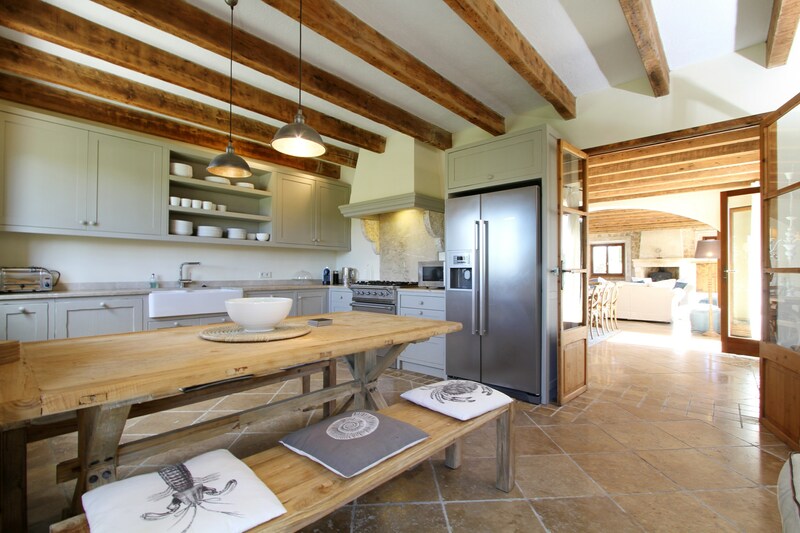 This impressive, spacious grand country manor house has recently been thoroughly modernised to provide a dream-like holiday rental property. 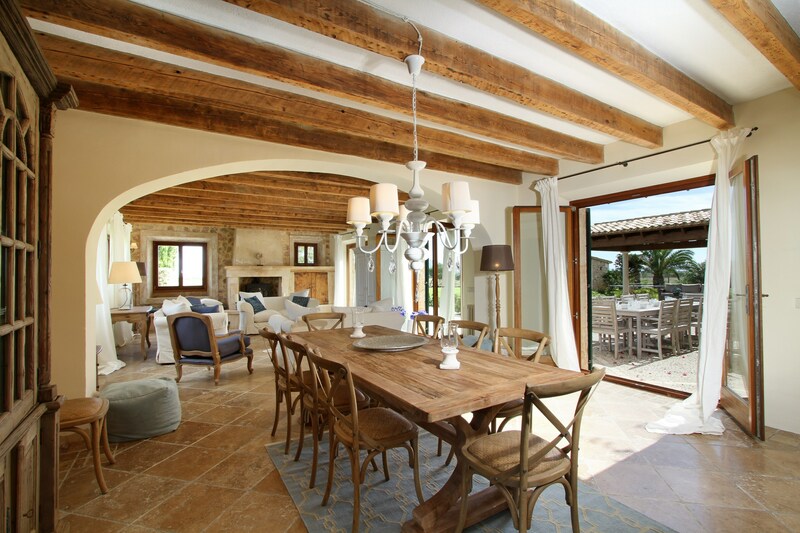 Solidly constructed from traditional Mallorcan stone, Finca Can Cuarassa represents everything that’s best about rustic Spain. 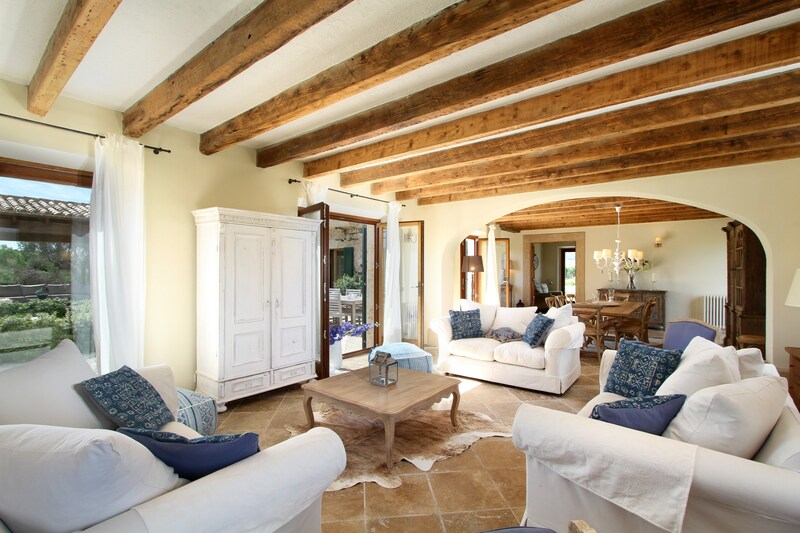 Solid wooden beams, terracotta roof, tiled flooring, wooden window shutters, spacious private grounds bordering a Nature Reserve…you really will feel like Lord and Lady of the Manor when you arrive here! 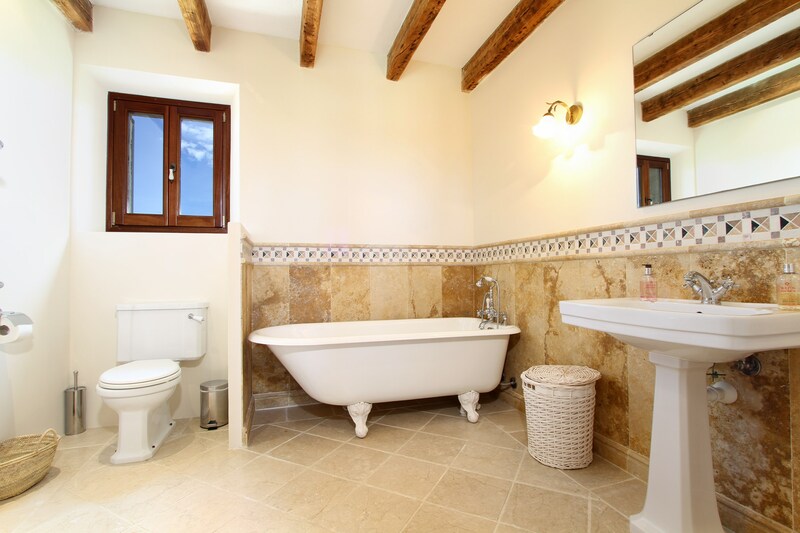 With six beautiful bedrooms and five bathrooms, it’s the perfect location for a holiday with family and friends. 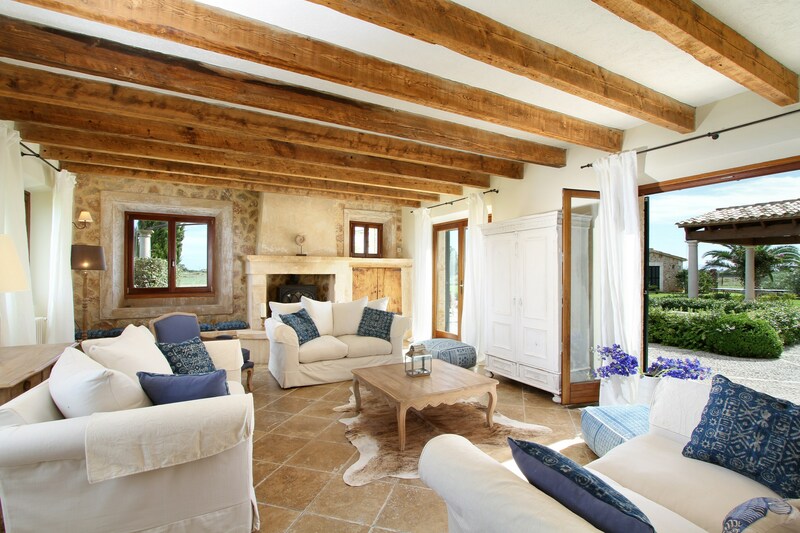 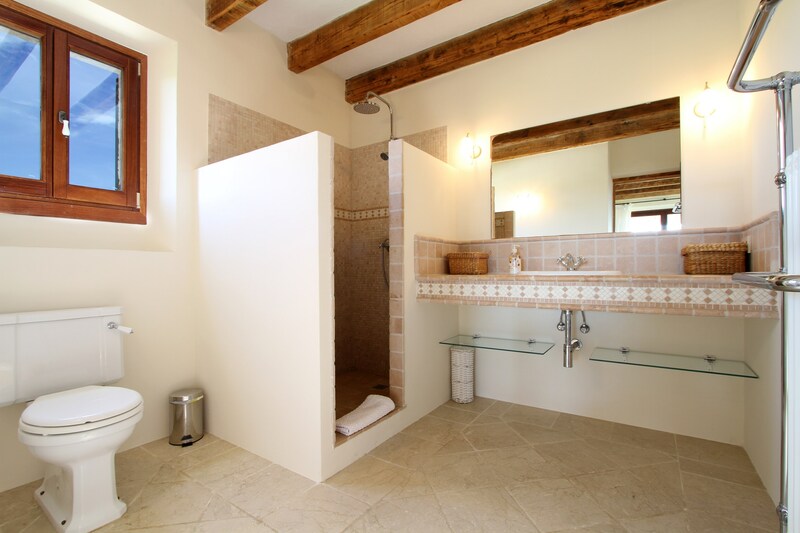 Finca Can Cuarassa enjoys a UK Sky TV subscription including Sky Sports channels. 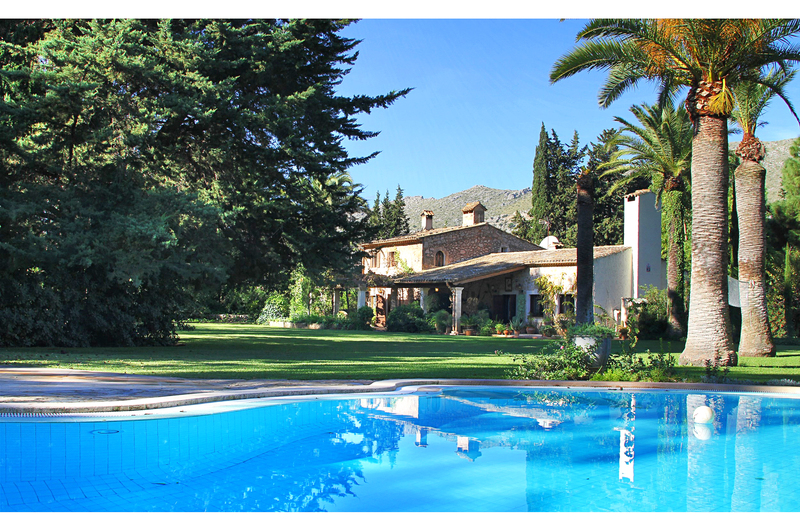 Want to keep in shape? 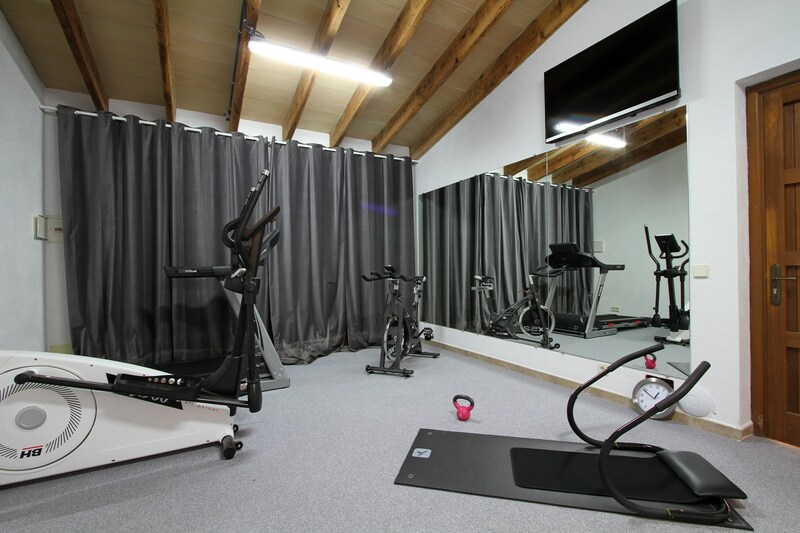 Why not take advantage of the family gym where you’ll find various exercise machines and a large flat-screen TV on the wall. 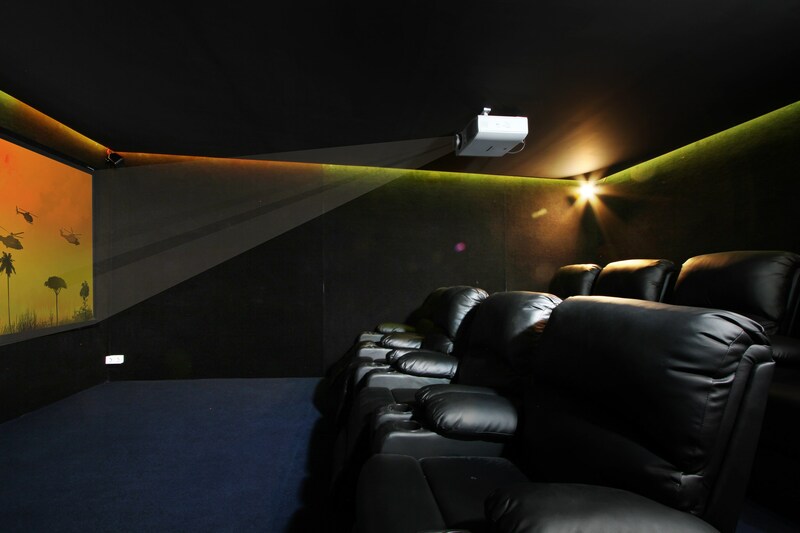 A rather special touch here is Can Cuarassa’s private home cinema. 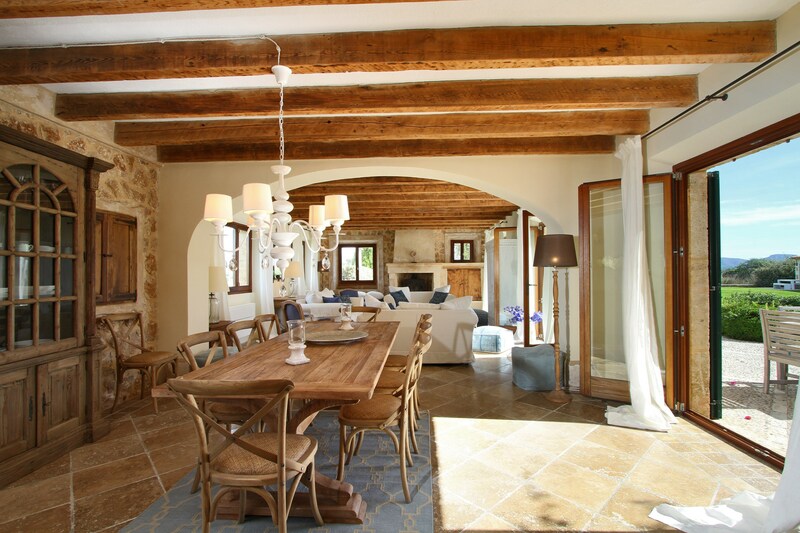 Seating up to eight people, it’s perfect for getting together with the family to watch a movie. 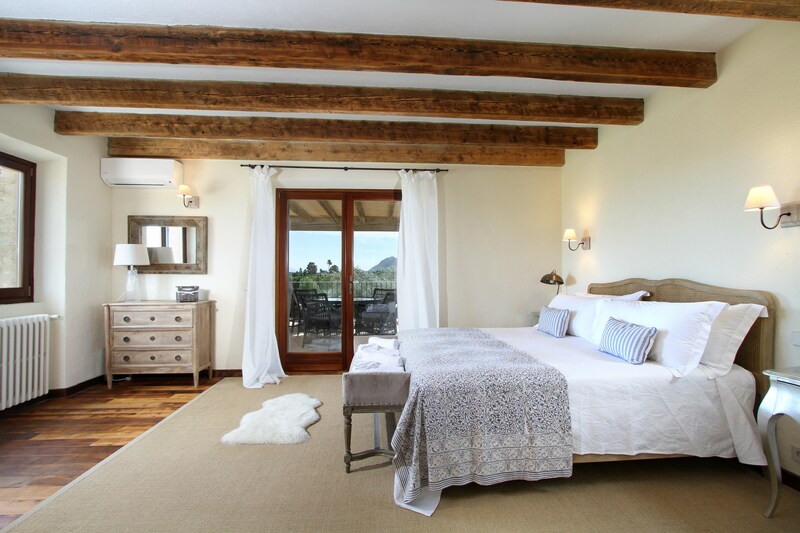 Upstairs, the master bedroom features a gorgeous antique double bed guaranteeing a good night’s sleep, as well five additional cosy bedrooms. 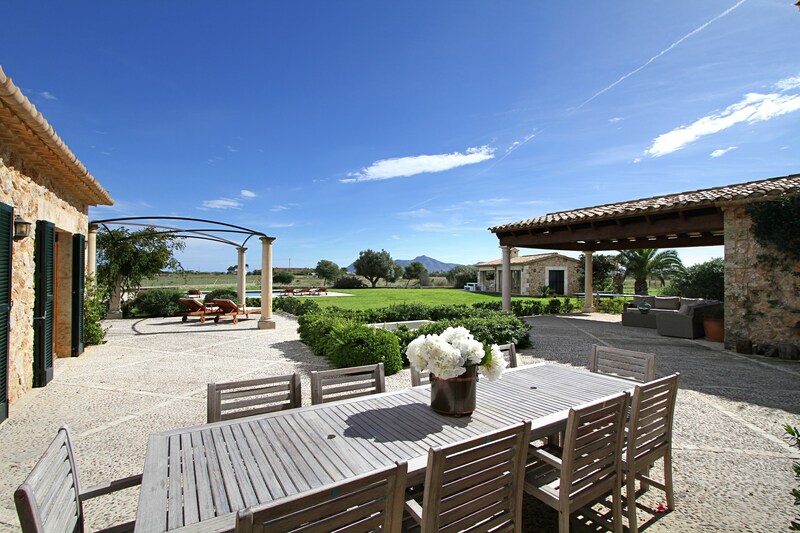 The spacious outside area at Can Cuarassa is no less impressive. 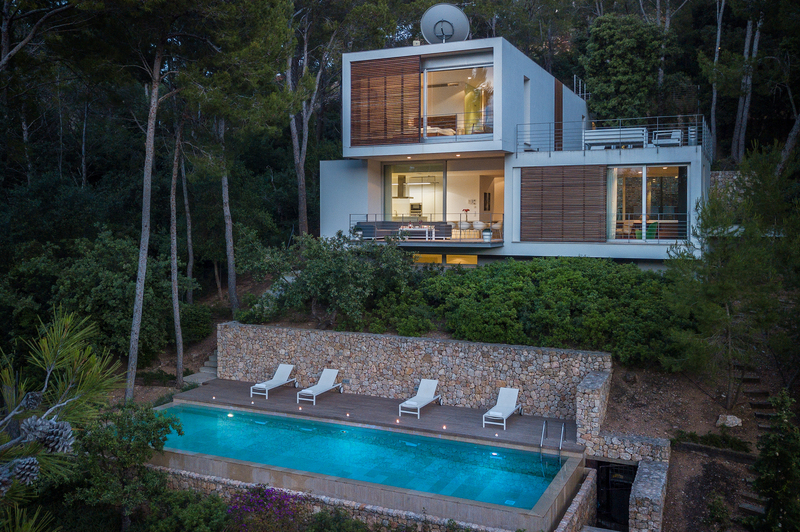 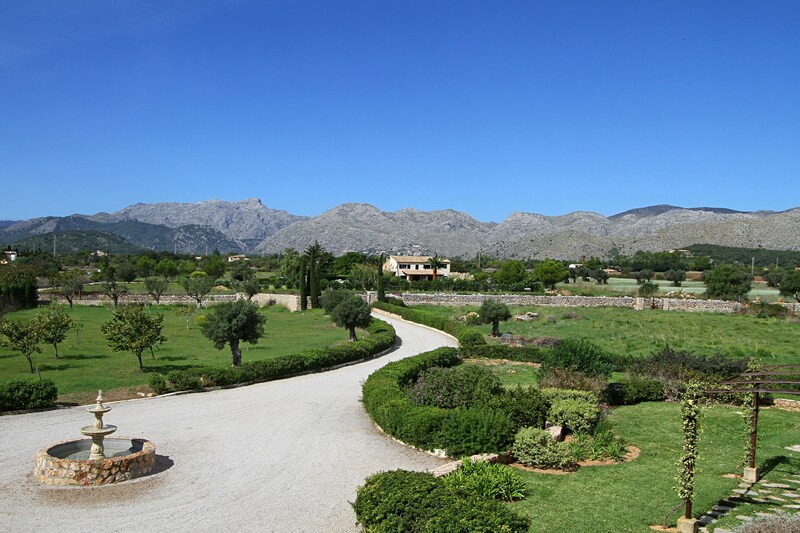 You’ll find a lush front lawn, mature trees and shrubbery, traditional stone walls, and the most fabulous 360-degree view of the Tramuntana Mountains. 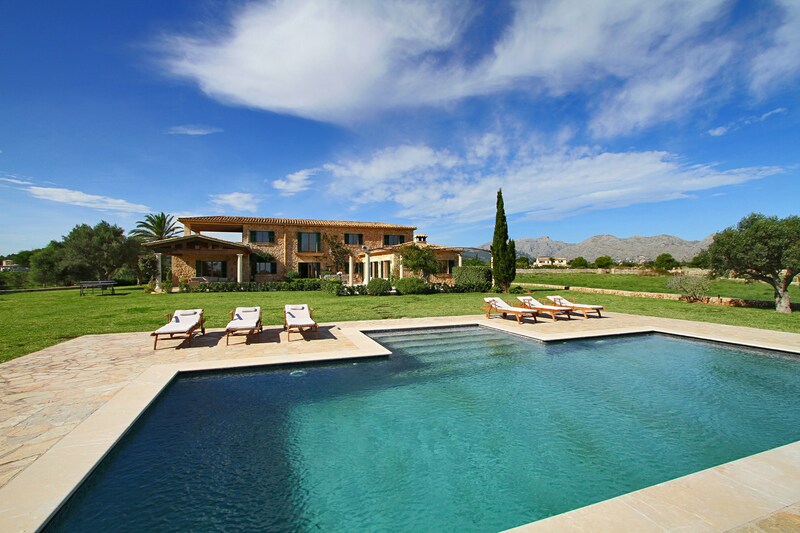 The property prides itself in a large, rectangular private swimming pool with a stepped entrance for easy access. 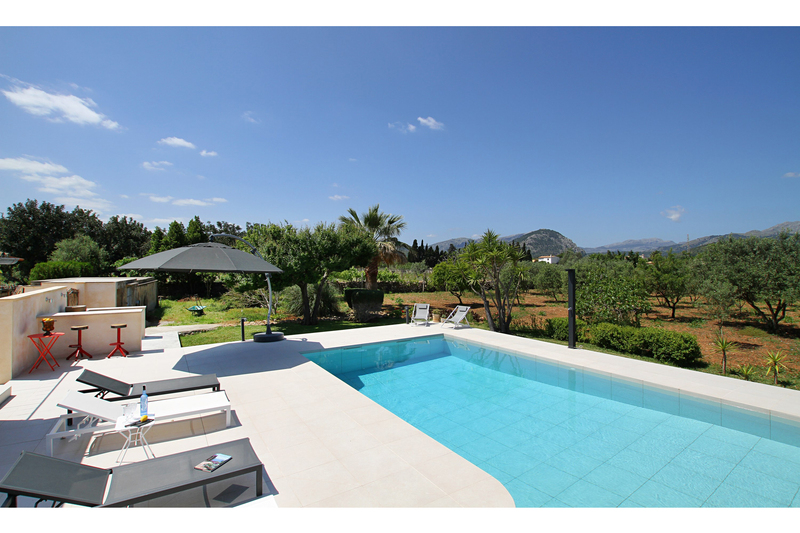 Jus perfect for a morning dip before the temperature rises. 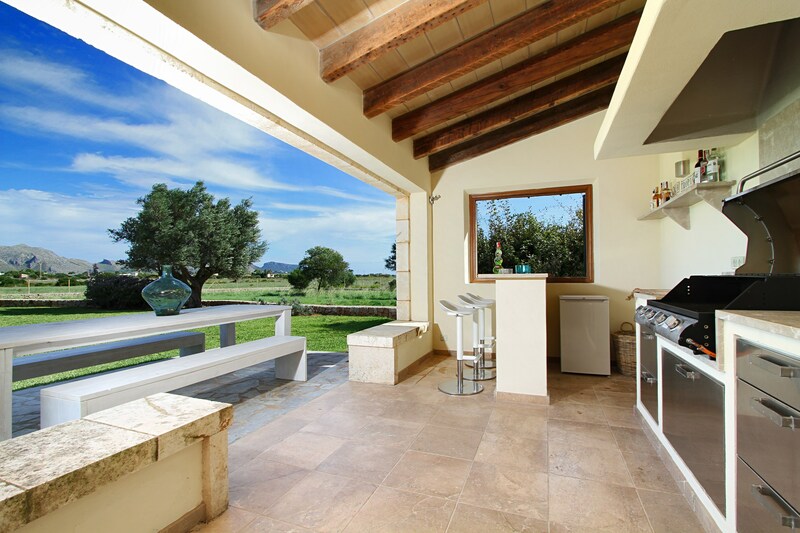 There’s also a covered bar and BBQ area which is ideal for a spot of al fresco dining and enjoying a ‘sundowner’ or two. 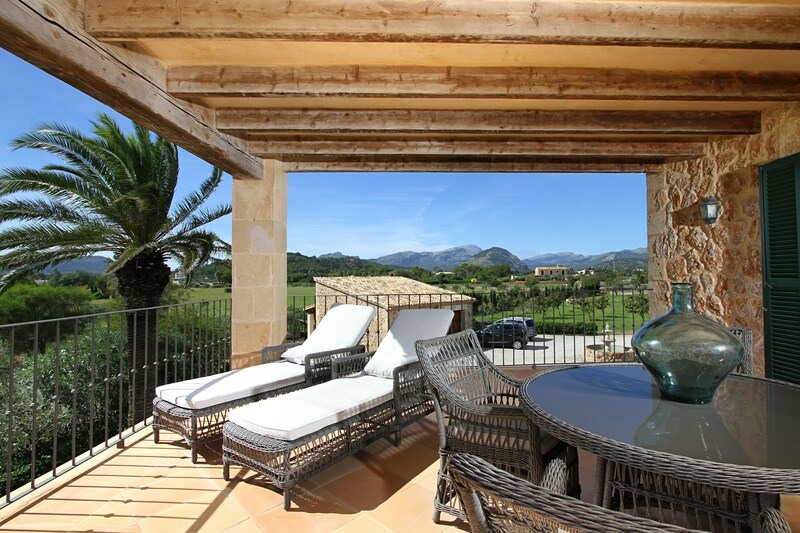 Even though Can Cuarassa offers the perfect place to enjoy peace, tranquillity and privacy on your holiday, you are just three miles away by car (or bicycle) from the lovely town of Pollensa where you’ll find some fabulous restaurants, bars and boutiques.